My five year old daughter sleeps with approximately 240 stuffed toys in her bed. You would think that when one of them goes missing, she wouldn’t notice, but she does. When a stuffed animal is not in its normal place, bedtime comes to a grinding halt as we search high and low for the missing toy. It. drives. Me. Bonkers. The last thing I want to do at bedtime is hunt down an MIA toy bear or fluffy caterpillar. 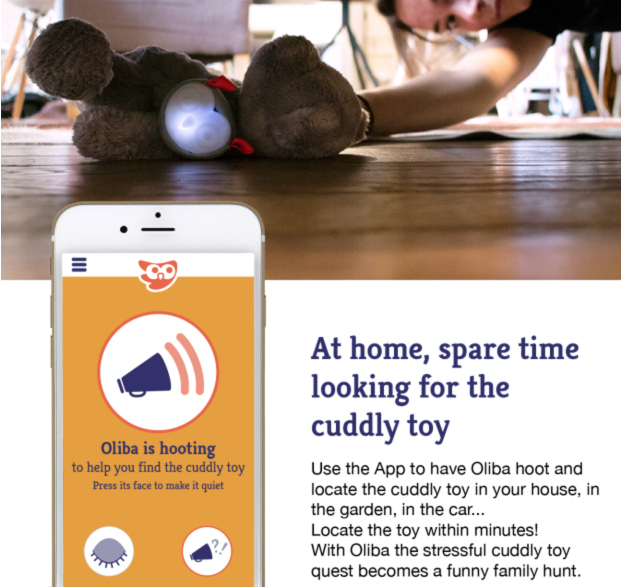 Oliba, which calls itself, “The first smart buddy of children and snuggly toys”, can hopefully bring my toy woes to an end – though tracking is only the tip of their feature list. Charged through a standard USB port, Oliba is a small, circular device that looks like a cartoonish owl. The product is fastened to a child’s snuggly toy (or any toy, for that matter), and is paired via Bluetooth to a smartphone. Oliba has three primary functions. First, it acts as a toy tracker, making a hooting noise when triggered from the app, or if the toy gets further than 100 feet from the smartphone, an alert is sent. 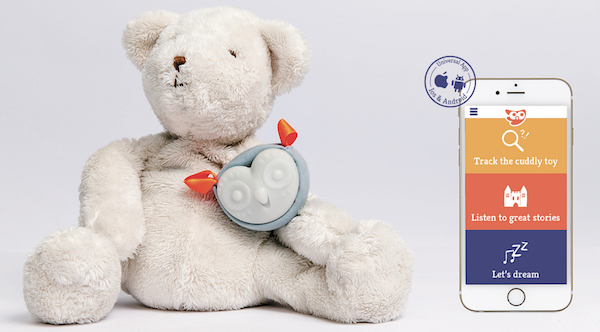 Between the hooting and the notifications, Oliba claims that lost toys are a thing of the past. 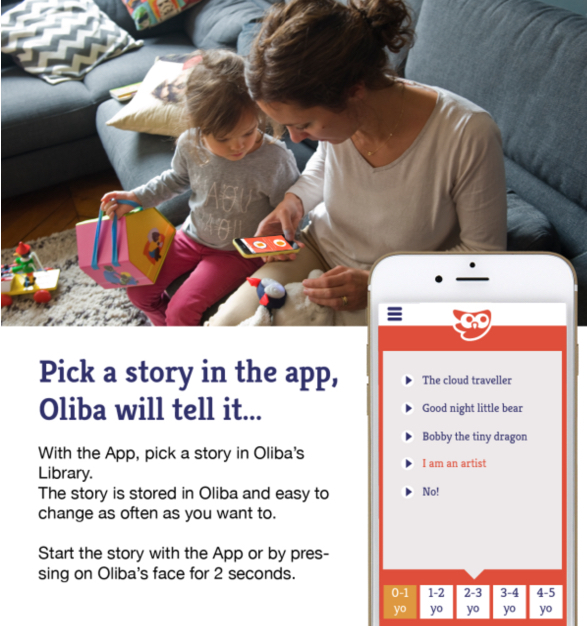 Second, Oliba plays stories for your children. You can choose between pre-recorded stories accessible through the application or you can record your own stories to replay from the device whenever you want. Finally, Oliba functions as a nightlight/lullaby machine; it glows in the dark and can play soothing bedtime songs for your children. As I scope out Oliba, I find myself a bit conflicted. I already feel like I pawn my kids off on technology too much as it is. When I need a break from them, I give them my iPad and tell them to watch something on Netflix. I know that’s crappy parenting, but sometimes it’s a necessity. Do I really want to outsource more of my parenting to technology? I mean, the tracking function is pretty sweet, but I’m not sure how I feel about using a piece of tech to tell bedtime stories to my kids. Then again, Oliba is not a “screen”, so perhaps it’s a lesser evil. The device is available for pre-order now starting at $39USD. Their IndieGoGo campaign wrapped up just last week (January 9th) and raised just over $32,000, which was 106% of the goal; they plan to ship their first batch of units to backers in June. Oliba is based out of France. Great idea! As the age for using “smart” things gets younger, the toys like this are a great direction to go and get the younger generation using them.